Keep scrolling past the video for the full recap & results! Sunday was a real mixed bag of weather – we delayed our opening slightly because of strong winds & rain. The wind dropped heaps throughout the early afternoon & the clouds cleared just before the 4pm start… all that making for incredible racing conditions down the 1300m descent from the top of the mountain to the Cardrona Domain. The open men’s division was always going to be an absolute battle, with three-time champ Conor Macfarlane lining up against cross-country Olympian Anton Cooper, Charlie Murray, & locals Jimmy Pollard, Pete Robinson & Anton Cousins. The fight for top spot between Conor, Anton & Charlie was one for the books, with the lead changing a few times in the race. The deciding factor between Conor & Anton ended up being the final stile over the fence above the Domain, with Conor just pipping Anton by a measly 2 seconds at the finish line for his 4th Mega win, Charlie crossing just a second after Anton. This year’s course was almost identical to last year’s, with a few minor tweaks along the way. Worth noting is that Conor’s finish time this year was within just 9 seconds of his finish time last year – to win the Mega you’ve got to be getting down the whole course in under 14mins & 30secs! What is this? A mountain bike race for ants?! Aerial shots by Sean Craig. In the open women’s division, Melissa “Mops” Newell defended her title yet again, smoking her field by over a minute. She’s the true queen of the Mega! The juniors battled hard with less than a minute separating the top three – local teen Jack Colbourne taking top spot, with Josh Culling right behind him, & Thomas Begg rounding out the podium in third. 11-year-old Amy Benson was the only junior female (& one of the two youngest racers of the day), & crossed the line well before some of her adult counterparts… go Amy!! The “Turtle” competitors found gold nuggets along the way to claim spot prizes from sponsors Mons Royale, Trek, GoPro & Dragon. A cold brew from Altitude Brewing was enjoyed by a few competitors at the end of the race. 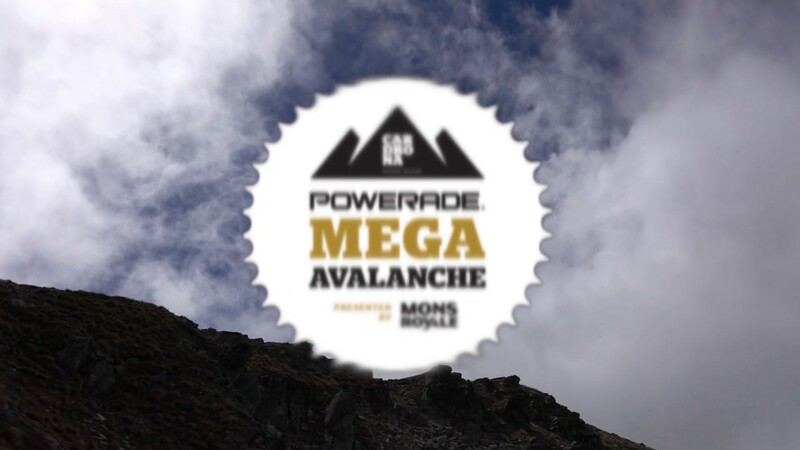 Big thanks to Powerade NZ for providing the prize money for this year's event. Someone up there was looking out for the Mega – just after the race finished the weather packed in again with hail on the mountain! It was another epic race in great conditions… we’ll see you all next year!